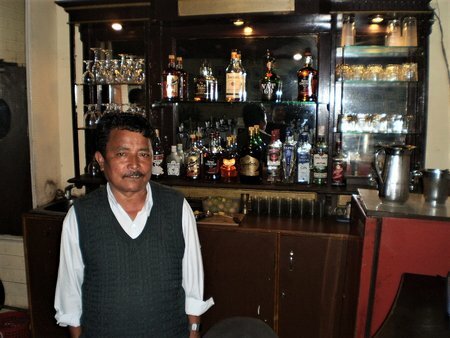 Glenary's Restaurant & Bar has been a landmark of Darjeeling since many years. This two storied white building located on Nehru Road and just a minute's walk from the Mall is special and close to the heart of many Darjeeling lovers. 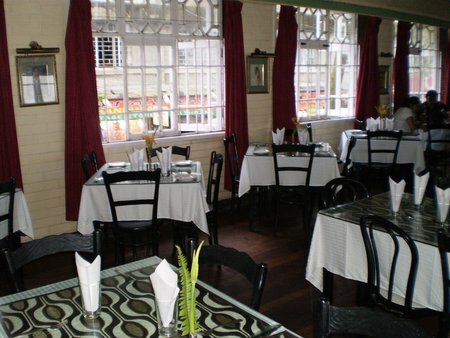 The restaurant is over 100 years old and was established during the British colonial days. Today it's privately owned by the Edwards family who are resident of Darjeeling. There is a short walkway from Nehru road that leads to this building that has its own open space in front. Having an exclusive open space in front and that too in a hill town like Darjeeling where land area comes with a big premium, is a rare sight. Having been established back in the British Raj days, Glenary's has been fortunate to enjoy such a premium space. The building has several sections. 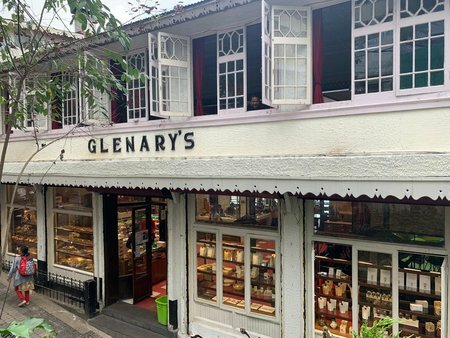 The Glenary's Bakery and Cafe is located at the ground floor. The Buzz Bar is located at the basement of the building. The main restaurant is located on the upper floor. You can access the staircase to the upper floor restaurant either from the ground floor bakery, or through a separate narrow entrance on the right side of the building. The dining room is large and impressive. Several glass top wooden tables and chairs with black finish are laid all across the dining room. The tables have white table cloths, metallic vas with fresh flowers, and glasses with napkins inserted in them. If you look up, the ceiling is quite impressive as well. It's painted with green and off white combination and has many carved artwork. With white wooden framed glass windows and wooden floor, the ambience of the restaurant is quite polished and appealing. The Glenary's restaurant has recently undergone some renovation and restructuring. The well stocked bar which is now located next to the entrance door, used to be on the opposite side of the room and at the end. There used to be sofas on the right side of the room offering wonderful views of the mountain range. Those seats were the first to get filled up. Now they have been all replaced with tables and chairs. However the great views through the windows are still the same and during the day time, that area on the right is still a coveted seating place. On the left too there are window-side tables. From here you can watch the busy Nehru Road below and all the activities there. These tables are great to watch the people walk by as you relish your food. On one side of the dining room and next to the bar counter there is a glass make fridge that stocks a lot of cold drinks and soda. For starters some of the great dishes are pepper chicken and Chinese fried chicken. You can also go for fish finger, cheese balls, French fries, pakodas and crispy fried pork. Alternatively, you can go for one of the many soups. We like Chicken clear or chicken mushroom soups. You can also try hot & sour, chicken corn, vegetable or tomato soup. In Continental, some of the great dishes include mixed grill, roast chicken, chicken hamburger steak and fried fish & chips. There are pork and beef items as well like roast pork, roast beef, beef steak etc which you can have with a portion of French fries. Other great dishes are Fish or Vegetable Au Gratin, or even baked cheese macaroni. In Chinese, some of the great non vegetarian dishes include sliced chicken with vegetable, chicken or fish manchurian, chicken mushroom, chicken or pork chilly and Chinese roast pork. In vegetarian, you can go for Chinese vegetable, baby corn in hot sauce or veg manchurian. Tandoor items at the Glenary's are our first choice. Favorites include Tandoori chicken, chicken reshmi kababs, chicken tikka kabab and the fish mahi tikka. You can combine it with tandoori roti or naan. Garlic naan is really great. For desserts, the brownie with chocolate sauce & ice cream is great. Or you can just try an ice cream or even the fruit salad. For beverages, they serve tea & coffee in pots, cold drinks, juices and fresh lime & soda. Note that all food items are subject to a 13.5% VAT (Value Added Tax). Glenary's has a well stocked bar. They have a nice collection of Indian and foreign whiskeys, brandy, rum, gin, vodka, beer, wine and cocktails. They serve wine by glass and also by bottle. There are both gents and ladies toilets at the restaurant. The restaurant serves lunch & dinner. You will get breakfast at the bakery & cafe below at the ground level. They accept credit cards. TIP: Try to avoid Glenary's during the rush hours, particularly if you are in a large group. They don't seem to have any guest queue management system in place and do not keep track of who may be waiting before who. It's like free for all, go & grab a table that becomes free. Glenary's is a partner of Darjeeling Tourism Card and offers attractive discounts to card holders for food, beverages as well as bar items. Glenary's is located on Nehru Road that leads to the Chowrasta Mall. As you walk along Nehru Road, you won't miss this two storied white building on the left. Mall is less than two minutes walk from the Glenary's. 2) Visit Darjeeling Nightlife, Bars & Pubs to know about nightlife options in Darjeeling. We had lunch at Glenary's and loved the old world charm of that place so much and we again visited the place for tea in the evening.